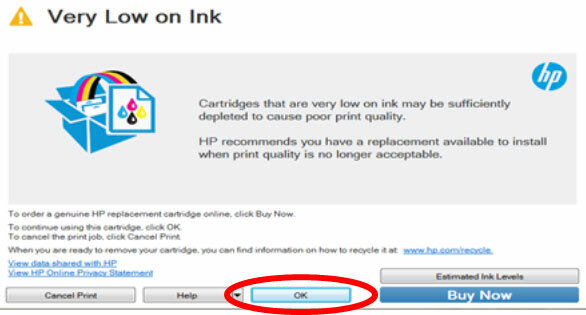 This section will help you better understand “low ink” warnings which appear after refilling and then re-installing a HP 62 and 62XL ink cartridges into the HP Envy or Officejet printer. 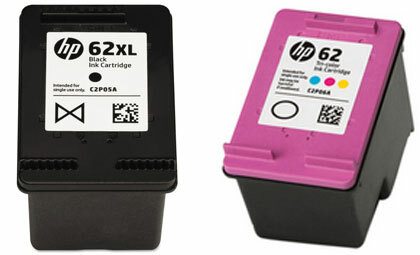 NOTE 1: “Empty” and “Low Ink” alerts are COMPLETELY NORMAL for all HP 62 / 62XL ink cartridges which have been refilled! While at first this may be an unusual workflow, it does allow print operations to proceed. In many cases ‘Ink Out’, ‘Empty’. ‘Low Ink” and ‘Nuisance’ alert messages will be displayed, including ‘counterfeit cartridge’ or ‘non-genuine ink cartridge’…these are normal nuisance alerts that can just be ignored by pressing continue/dismiss/Ok. You should be able to continue with print operations until the print quality begins to fade. Once an HP 62 or 62XL ink cartridge is inserted into your printer, the printer begins to track the ink used for that particular cartridge. 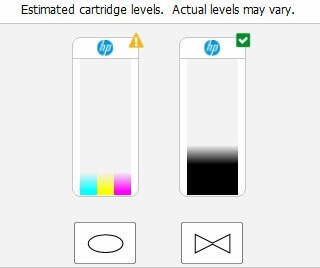 When a new HP cartridge has used about 80% of its ink, the printer will begin to message “your ink level is low” warning messages, etc. After the cartridge is refilled, the printer may continue to send out these warning messages. These warning messages may simply be ignored, and the printer should continue to operate normally. Unfortunately, the low ink alerts cannot be reset or bypassed when using refilled cartridges. NOTE 2: If a “Non-HP Cartridge(s)” message, or similar alert, cannot be bypassed then the cartridge may be suffering from marginal internal electrical performance and may need to be replaced with a brand new cartridge. First remove and thoroughly clean cartridges electrical contacts & printer flex cable contacts and retest. If the problem persists then return cartridge to your refiller for analysis. CAUTION: It is suggested you avoid purchasing ‘compatible/clone’ ink cartridges as they can be quite problematic. The smart chip (at base of cartridge) may not provide reliable printer-cartridge connectivity once installed. Compatible/clone cartridges are typically purchased on-line and is essentially a “knock-off” ink cartridge of the OEM (original/genuine) ink cartridge. For the best refilling experience, only use OEM original/genuine ink tanks or remanufactured OEM cartridges which have been cleaned, refilled and tested for proper performance (i.e. like Inkplicity).